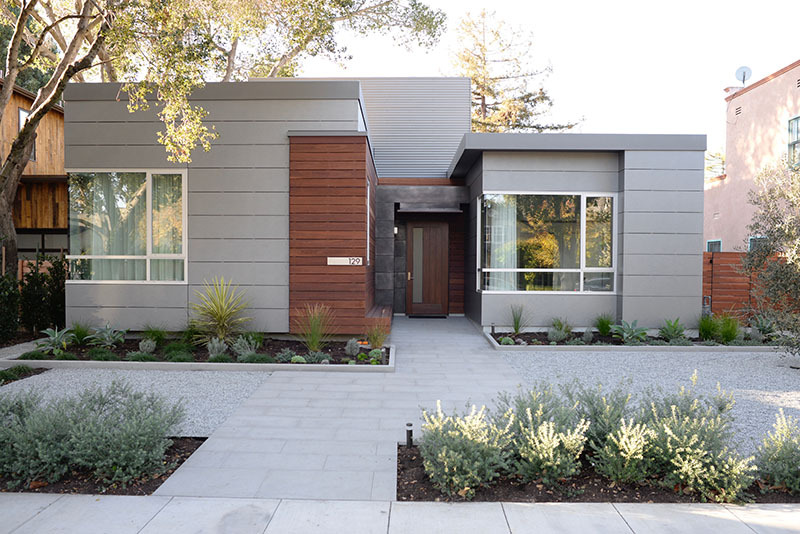 The Silicon Valley Modern Home Tour is Happening Today! Purchase tickets at the door of any Tour home ($50 cash or check to “Modern Home Tours”) between 11am and 3pm, or click here to purchase tickets online and bring your ticket (or your receipt on your mobile device) to any Tour home and exchange for a wristband. 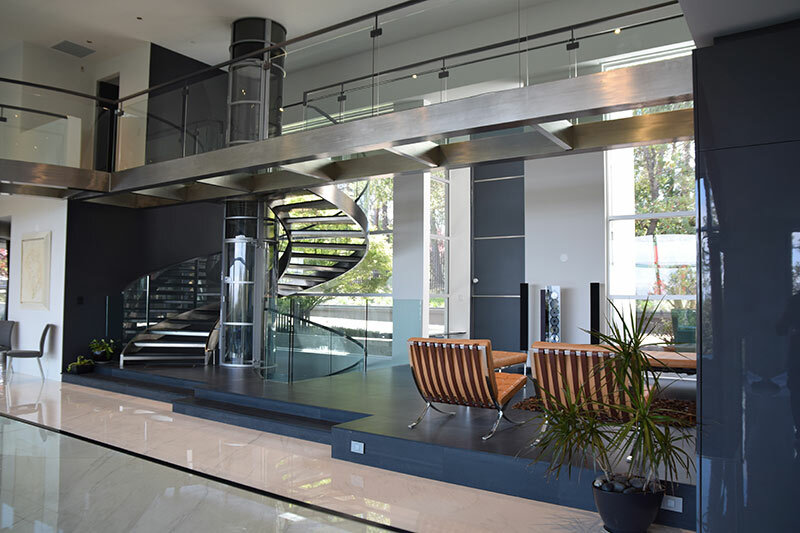 Start at any home and enjoy the day touring modern architecture and design! (You can preview the homes by scrolling down this page.) See you on the Tour! 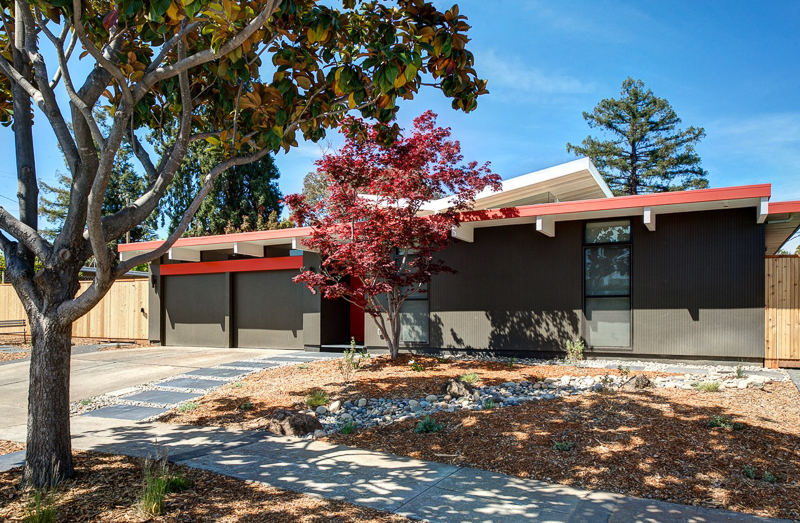 Join us on June 9th as we get up close and personal with the architects, designers and homeowners that define Modern in the Silicon Valley! 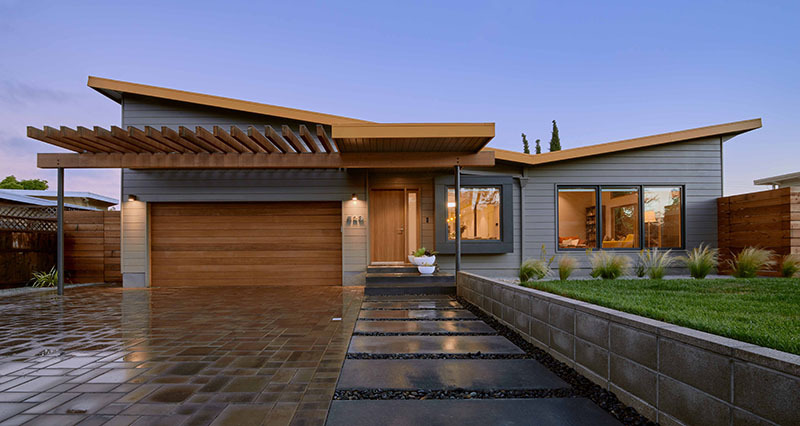 From one of the very first Eichlers ever built to an ultra-contemporary 10,000 square foot dream home boasting the latest in sustainable tech, the 2018 Silicon Valley Modern Home Tour is your chance to see the very best in modern architecture. Here's how it works. 1) Purchase your tickets 2) About 48 hours before the Tour, you'll receive a printable map via email 3) On Tour day, visit the homes (in any order and at your own pace) and enjoy the day supporting local architecture & design. 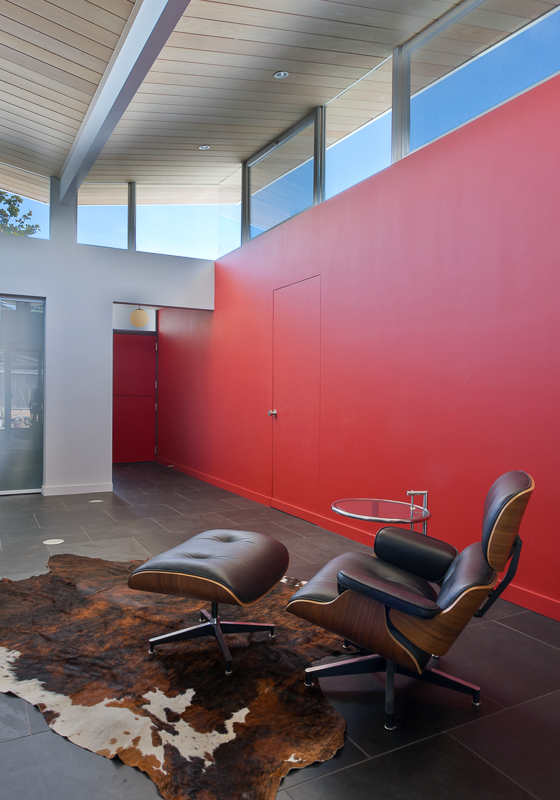 This new contemporary structure was built to house a burgeoning art collection for a family whose primary residence is on the adjacent lot. 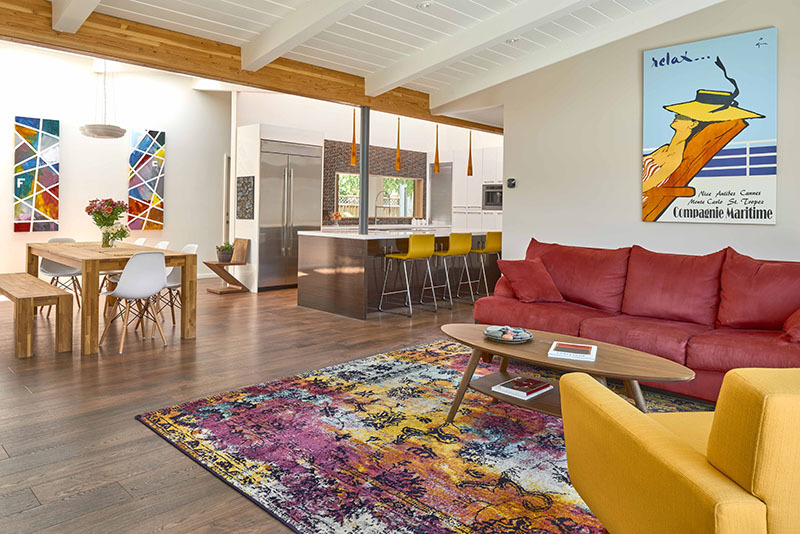 In addition to providing as much art wall space as possible in a modestly sized structure, the rest of the program includes two bedrooms for family guests and a study that serves as a home office. 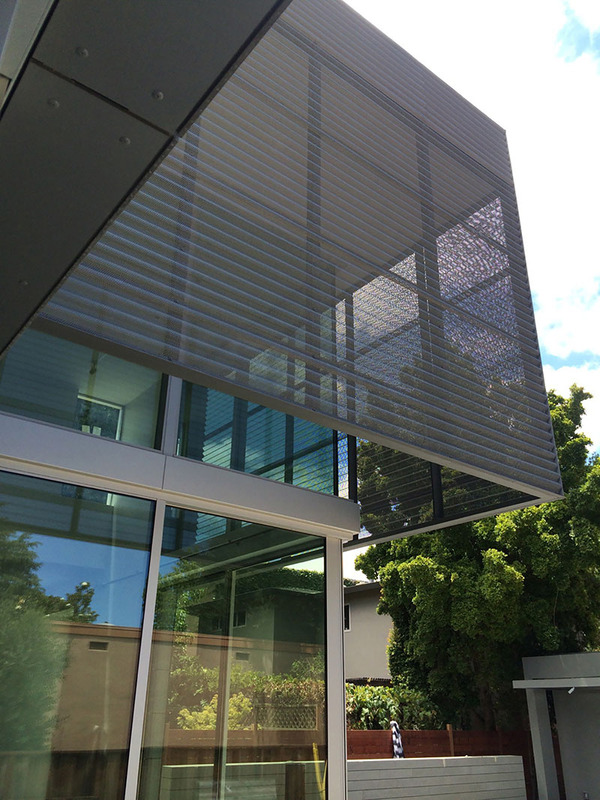 Daylighting is modulated through the use of a perforated zinc scrim that wraps the upper story creating shade and shadow patterns which change and modulate through the day. At the back of the site an outdoor courtyard, with a lap pool, provides a gathering place in warmer weather. 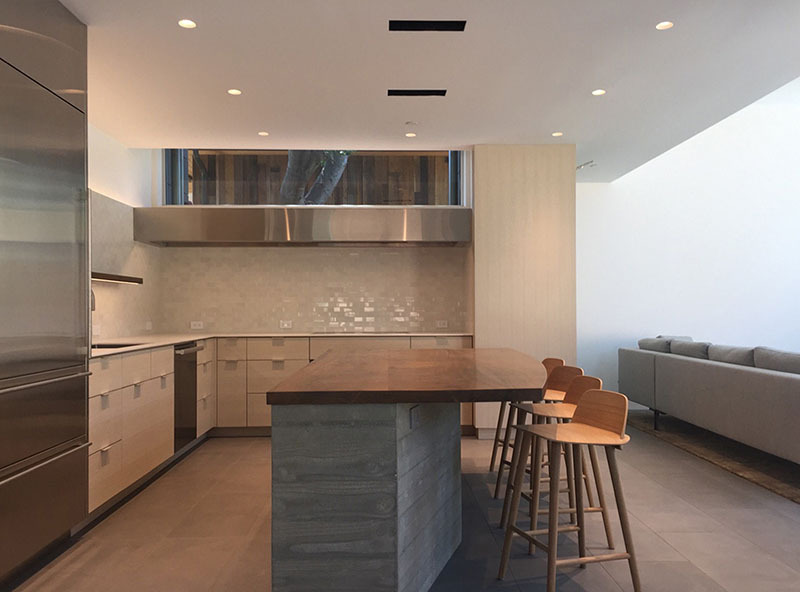 The neutral palette of interior materials highlights the art and includes stained oak and Pietra Serena limestone floors, while on the outside low maintenance requirements include the use of cementitious siding that will never require painting. 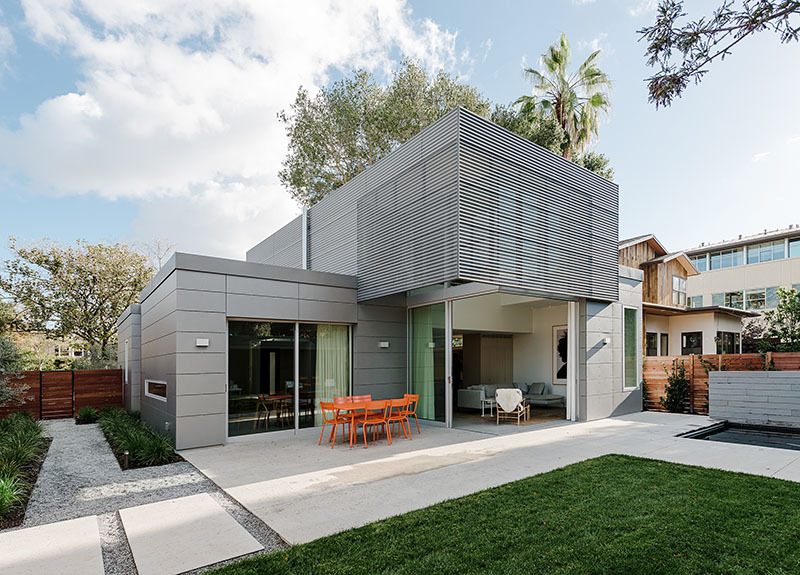 This ultra-contemporary project, the creation of an award-winning architect and a Silicon Valley tech entrepreneur, is an example of architectural design and engineering at the forefront of smart, sustainable living in the 21st century. The experience starts upon entering the house through the 15 foot high entrance door. 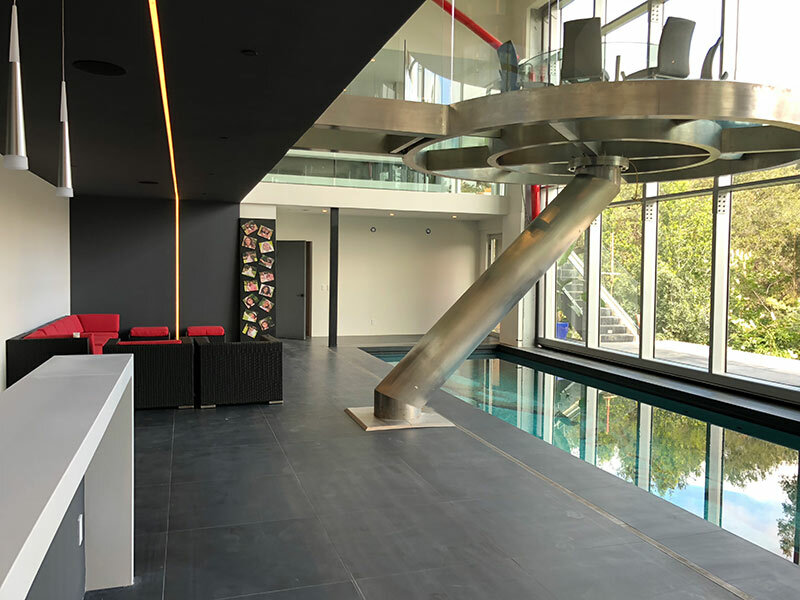 Once inside, one enters an awe-inspiring space – a great room with soaring ceilings and natural light flowing uninterrupted through a tall glass curtain wall that can be opened fully to create a true indoor/outdoor experience. The Great room is where every aspect of modern living can be experienced. 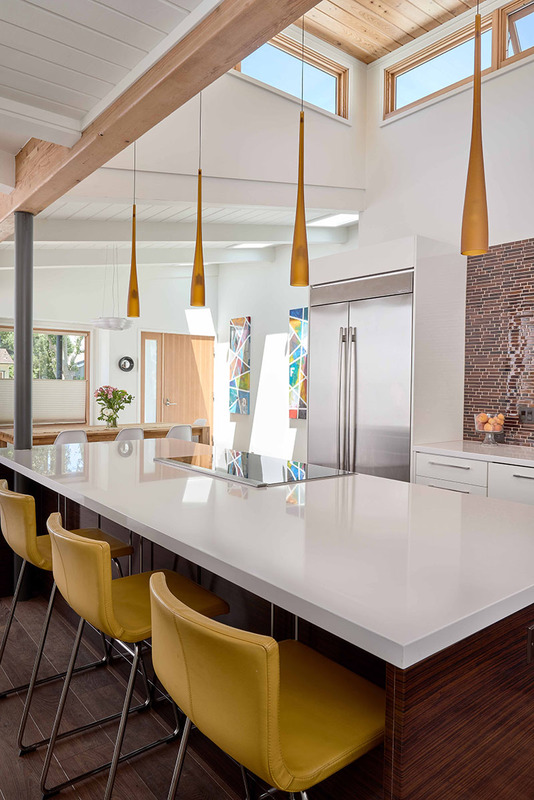 To the left is a huge kitchen with a 19 feet cantilevered Island cooking surface. To the right is the family room with a three-sided glass fireplace. 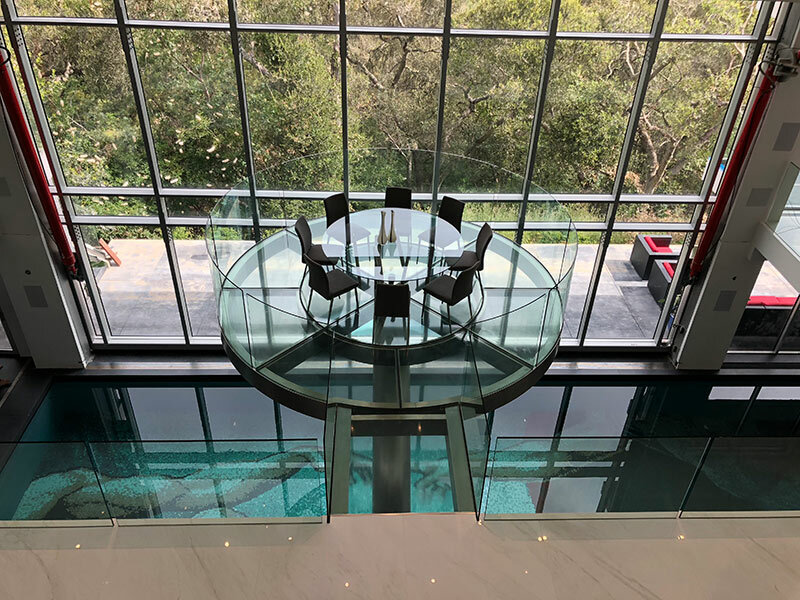 The center of the Great room with its circular glass-floored dining area cantilevered over a 60 foot long indoor swimming pool looks out over the scenic Bay and Silicon Valley. The floor of the indoor pool is made of miniature mosaic tile inspired by Michelangelo’s “hand of God and Adam” in the Sistine Chapel. The front north-facing façade of the Great room is a 23 feet tall by 36 feet wide glass wall supported by hydraulic systems. 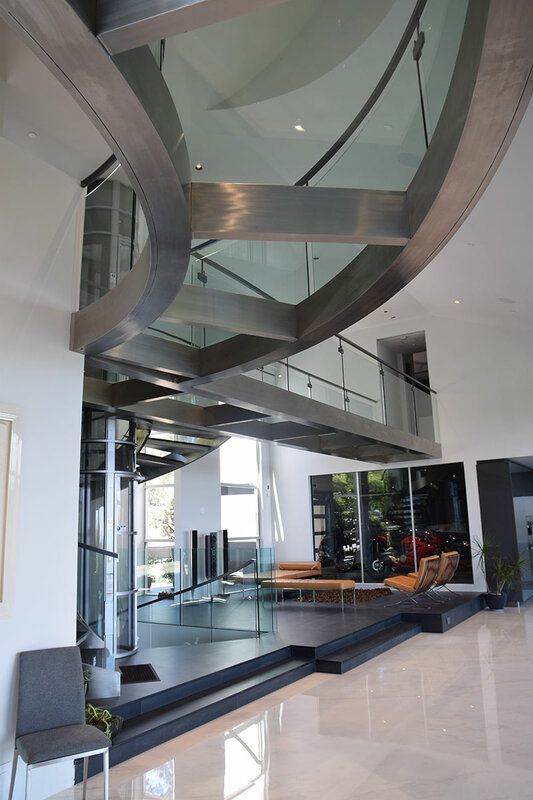 The entire façade of the house can be opened like an aircraft hangar door. Creating a harmonious balance between the ultra-modern living space and the natural world outdoors is at the heart of this architecture. This residence takes sustainable living to the next level. Green elements include highly efficient aluminum floor heating, rainwater harvesting, gray water recycling, Solar PV panels, dehumidification and a fresh air circulation system for optimal health and comfort of the family. General Contractor: Flegel’s Construction Co., Inc. 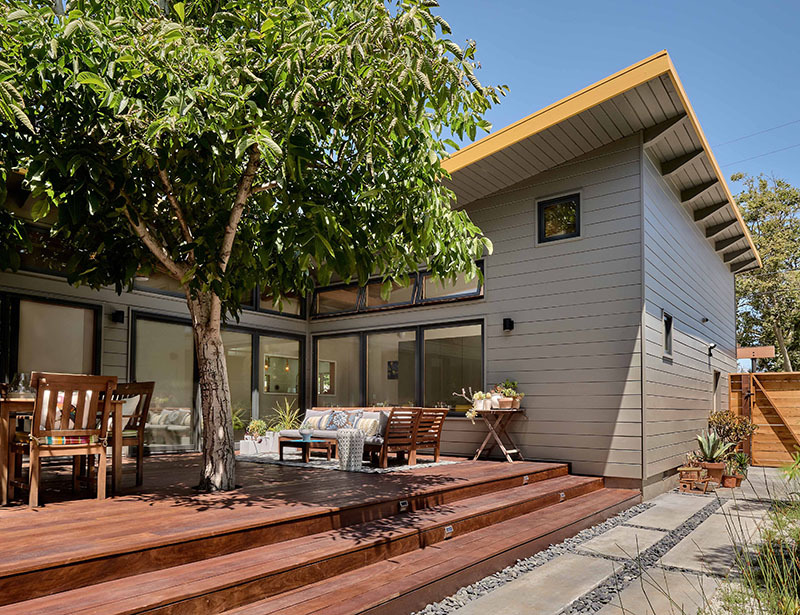 This is a restoration of one of the first Eichlers ever built, one of only a few true butterfly- roofed Eichlers (there were only two built in this neighborhood). We tried to keep the original feeling while solving some practical and aesthetic issues with the original design. The overall massing and street facade were kept, but an eyebrow roof and trellis were added to shelter the front entry and break up the height. A previous addition at the back was torn down and re-built, and a hobby room added behind the garage, creating a shaded interior courtyard. The windows were enlarged, keeping to the early style. 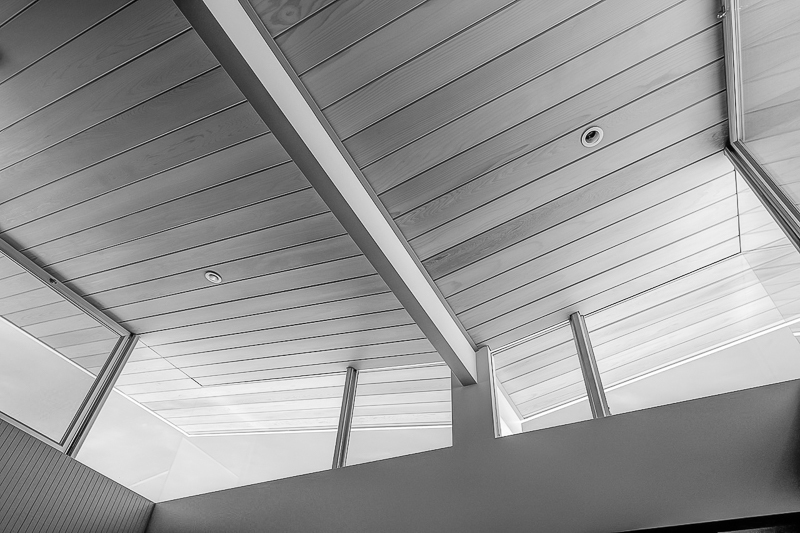 The exterior and interior were completely upgraded, using natural finishes to compliment the original approach. 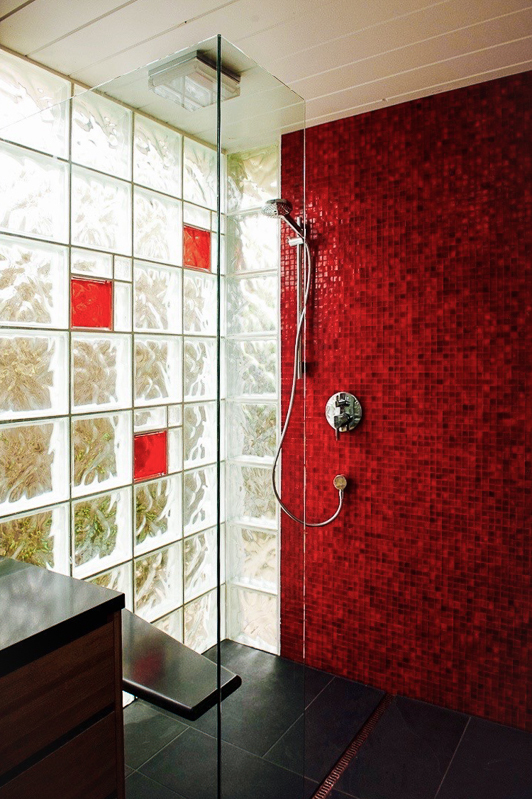 And the forced-air heating was replaced with hydronic radiant, the standard for future Eichlers. There is a large photovoltaic array at the back of the house, and the owner hopes to eventually go all-electric. This 1959 Eichler is the “1959 E 41” variation of the Anshen and Allen “E-11”. The owners lived here for over 20 years thinking about upgrading but waited until their two sons left for college. 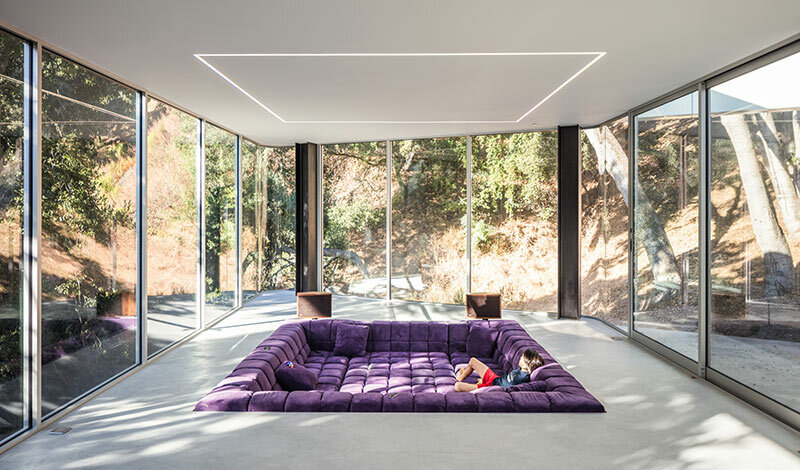 The garage had been converted to a family room and the atrium had been left open. 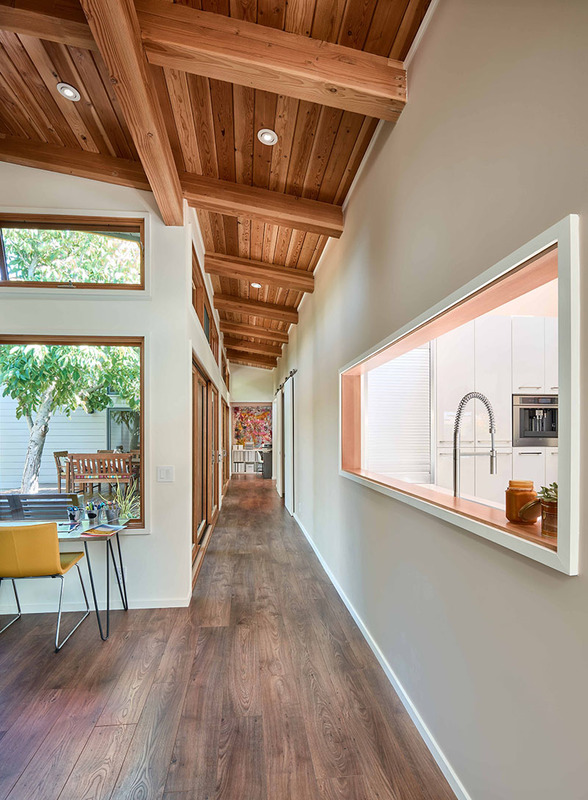 The primary intent of the remodel was to enclose the atrium to make it the core of an integrated living space. We also converted the garage back to it’s intended use. There are several houses on this block with the same original facade/floor plan. The clients wanted theirs to be distinctive. We decided on the butterfly roof in part because no one else was doing them, as well as for the purely aesthetic statement it makes. With the unframed glass corners it is a great white wing soaring over the darker, grounded base of the house. 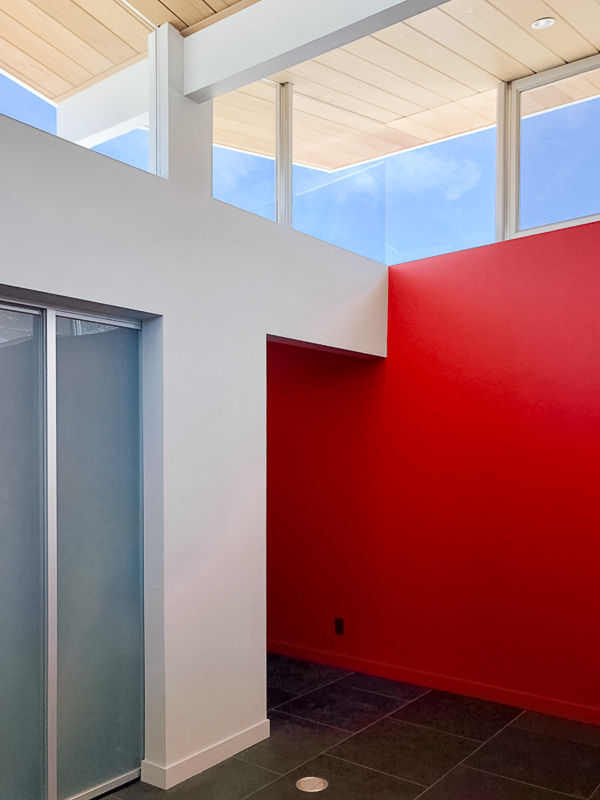 In keeping with the sculptural effect of the roof we used a Legorreta style color blocking on the interior with a Calderesque dividing wall, just for fun. In the course of the remodel all windows were replaced with insulated glass. Bedroom windows were converted to custom, wider, double hung full height units. These, along with the hopper windows in the butterfly allow for natural convection cooling by opening the lower windows on the shady side and the butterfly windows to allow the hot air out. The entire electrical, water supply and waste systems were replaced and upgraded along with the addition of two gray water systems and a storm water system. Both baths were completely redone, the master suite enlarged and a window seat added as well. The intent was to create a more livable home, with a bright, useful central core linking all of the living spaces, without adding a lot of square footage. 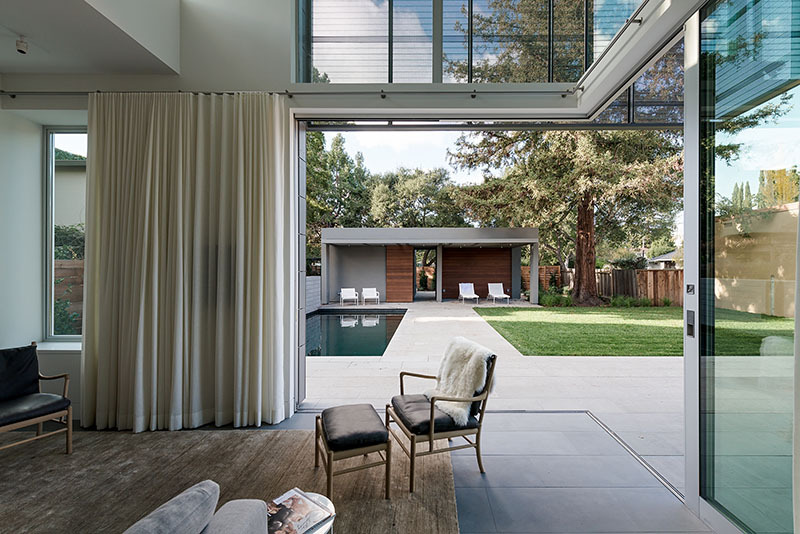 The conceptual idea came clearly and quickly—float a glass box in the leaves of the trees on two trunk-like columns, disrupting as few oaks as possible. The dense tree canopy offers the opportunity to build a completely glass walled house, protected from the direct rays of the sun, yet filled with dappled sunlight. A bridge of steel grating connects grade to the rooftop of native grasses. 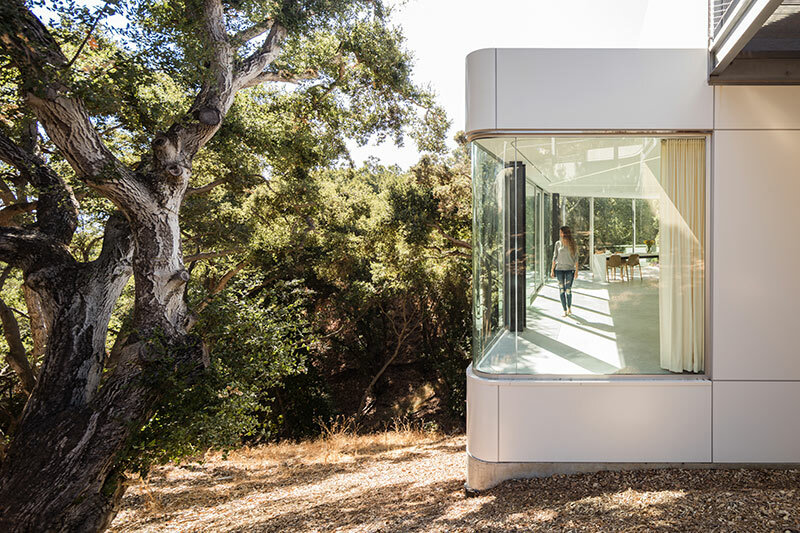 An observation deck sits in the grass field along with a garage/foyer of zinc panels and mirror glass. Sunlight funnels down through the foyer into the living level. 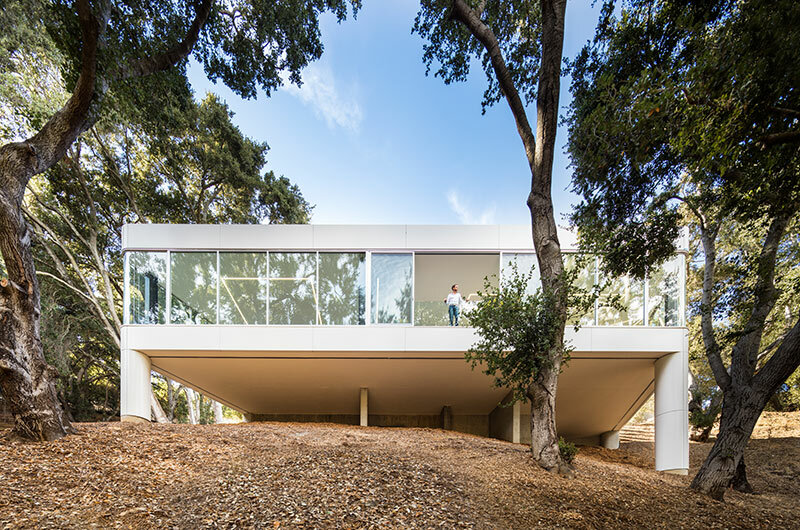 The main living area is cantilevered into the tree canopy while bedrooms, bathrooms, service and storage are located behind a long wall of cabinetry along the hillside. 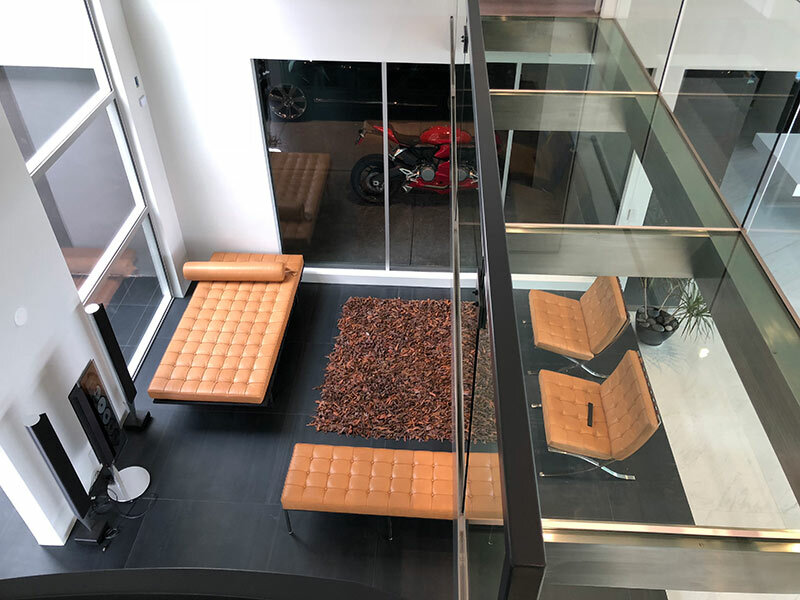 Distinct spaces (the living room, the office, and the kitchen) are delineated spatially in the open plan by sinking them into the concrete floor. These spaces are further delineated by material. In the sunken office, all surfaces— flooring, desk, cabinetry— are milled from a single slab of Chinese pistachio. The sunken living room is filled with 144 sq. ft. of B&B Italia’s “Tufty time” sofa components. In the kitchen/dining room a 22 ft. long counter of white composite quartz continues the kitchen work surface into the dining table. In the ceiling, flush mounted LED strips imply these zones. Strong geometric lines of light, reminiscent of a Dan Flavin sculpture, are clearly visible from the outside looking up through the leaves.